The second edition of this classic book has be out since April 2014 and surpasses the first edition with new chapters on regulated deficit irrigation, red winemaking techniques including whole cluster fermentation, and the science of wine tasting. I consider this book my wine bible and refer to it more than any other on my shelf. I can’t tell you how many yellow Sharpies I have worn out in reading and rereading this book, because the text is crammed with important ideas and succinct explanations of some of the currently debated methods of modern viticulture and vinification. There is simply no other up-to-date reference that can compare. Goode is currently a UK-based wine columnist who contributes to several well-known wine publications. His blog, “The Wine Anorak” at www.wineanorak.com/blog/, has been online since 2001 and has been voted the “Best Overall Wine Blog” two years in a row. An additional reference, Wine Science Extra, has just be published by Jamie Goode. This e-book ($9 Kindle Edition) is a collection of chapters covering interesting topics in wine science that could not be included in the book. Consider it a supplement with five updated chapters that were dropped from the new edition and a final new chapter. 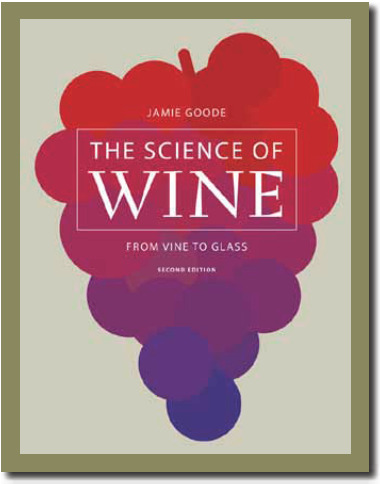 The Science of Wine: From Vine to Glass, University of California Press, hardback, 216 pages, $27.54.